President Barack Obama has arrived in New Delhi for a three-day visit to India amid an unprecedented security operation. Thousands of security personnel have been deployed in Delhi along with some 15,000 cameras. 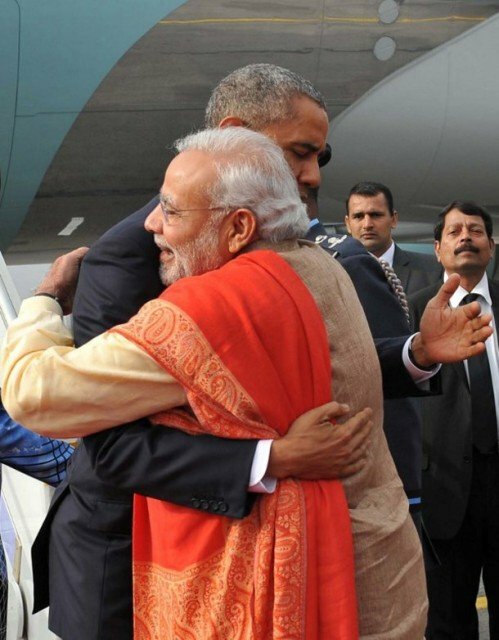 India’s PM Narendra Modi stressed the importance of the visit by breaking with protocol to meet and bear-hug Barack Obama personally at New Delhi airport. Their talks will primarily focus on trade, but also take in security, nuclear power and climate change. Barack Obama will also be the guest of honor at Monday’s Republic Day celebrations. After his arrival, Barack Obama travelled to the presidential palace, Rashtrapati Bhavan, for an official welcoming ceremony with his Indian counterpart Pranab Mukherjee. The president will also lay a wreath at the Mahatma Gandhi memorial and later attend a state dinner. He is being accompanied by a delegation of US business leaders for the important trade talks. In his talks with Narendra Modi, he is also expected to discuss co-operation on climate change and nuclear energy, concerns over security in South Asia and counter-terrorism measures. Barack Obama will join Narendra Modi in his monthly radio address to reach out to millions of Indians with no access to television. Security around the Republic Day parade is generally tight, but this year the high-profile visit has taken preparations to a new level. Security has been upgraded at several up-market hotels, where President Barack Obama and his team will be staying. Police have also been going door-to-door carrying out verification checks on residents. Security has also been tightened at airports, ports and railways stations across India. This is the first time a sitting US president has returned to India for a second visit – a sign of growing India-US ties. Barack Obama’s visit to India has been shortened so he can visit Saudi Arabia and pay his respects following the death of King Abdullah. It means he will not now visit the Taj Mahal.